It’s that time of the year again where I like to change up my skincare products; if you fancy a look at what I tested out last summer, then click here. As for this time round, I’ve given my routine a total (albeit gradual) makeover; from the cleanse, to the moisturise. Check out the products that made the cut below…. Step number one. Getting that makeup off! I’ve used cleansing balms for nearly a year now, and Emma Hardie’s take on it became my firm favourite; until now. I was spending nearly £40 a pop, and I felt that was far too pricey even with my Feel Unique discount. Yes I absolutely loved the stuff, but I was totally gutted when I made the mistake of taking it to Turkey with me; balm = melted = £40 down the drain…. literally. I went on the hunt for something more in my price range, and was amazed to find the Merumaya Melting Cleansing Balm; the same amount of product, a fraction of the price at £15.50, and in a tube (hooray no waste!). For a brand that I’d never heard of before I thought it may be a risk, until I realised I had a sample from my YouBeauty Discovery Box! Happy days. I gave it a whirl for a couple of weeks, which I was chuffed with for such a small tube to last that long alone, and was quite pleased with the results. It did the exact same job as Emma Hardie’s, the only difference being the scent. The Merumaya scent is very unique; I’ve read the odd review to find it’s not to everyone’s taste, but I don’t mind it at all. It smells very natural and non-chemical. After I’d used the last of my Liquid Gold, I was again needing a product within my budget that I could multi-task with. The Liquid Gold had so many benefits; I was needing something similar that I could use more frequently. In came La Roche-Posay’s Serozinc. So apparently zinc is good for the complexion, its benefits especially for oily, blemish-prone skin. Perfect for when I have an angry spot ready to surface, but capable of plenty of other things too. The spray can is great for making my skin feel refreshed after a warm night’s sleep. A little spritz on the face followed by a gentle excess patting with a cotton pad leaves my tired face feeling rejuvenated. The can is huge too, so will last me a very long time, and at £8.50, a total bargain. Onto the final step; hydration. I absolutely loved (and will still repurchase) the Origins Gin-Zing Moisturiser. It smells divine, is super soothing and hydrating, and sinks into the skin perfectly. However once I’d ran out, I was lucky enough to receive an Indeed Labs gift set for my birthday. One of the products was the Hydraluron Moisture Jelly; I found the idea of a jelly slightly odd, but after a little bit of research and skimming through some rave reviews I thought why not give it a go, as I wasn’t in a hurry to replace my Origins moisturiser for £24! The packaging is very different to the norm; with a pump applicator it makes for very little wastage. The jelly itself is clear but quite soft, with the texture of a gel. It applies and sinks in quite effectively, and feels hydrating without being too heavy. I think it’s a great choice for this time of year as it gives my slightly oilier summer skin the perfect amount of moisture. 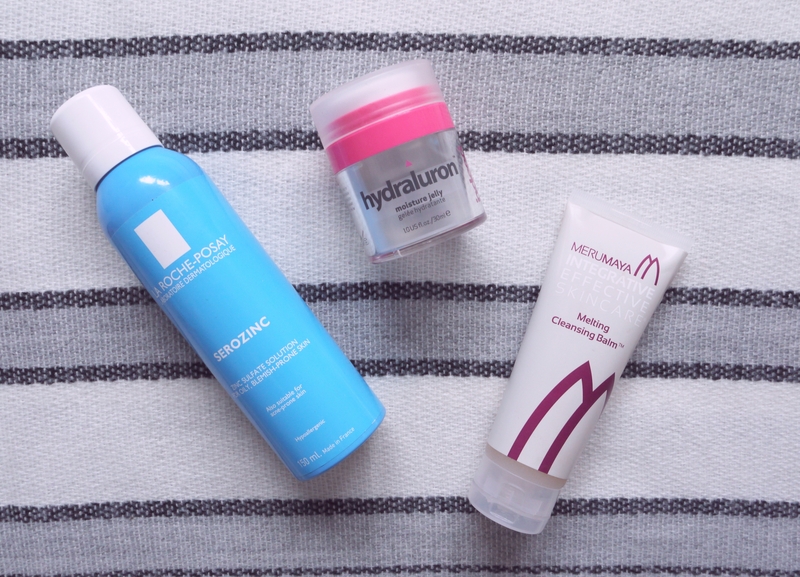 So these are the additions to my new skincare routine! A couple of them slightly more budget-friendly, but offering the same amount of luxury. Have you tried any of these products? I just love that spritz, so refreshing and cool these days!